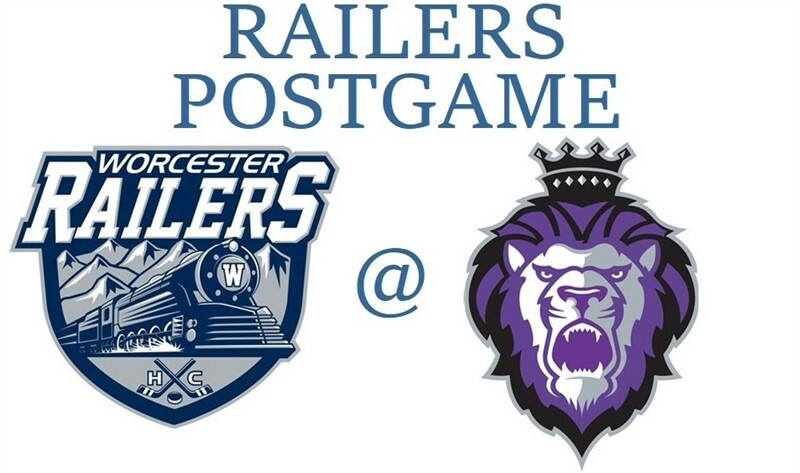 The Worcester Railers headed to Reading, Pennsylvania early Sunday morning for a late afternoon contest at the Santander Arena against the Royals hoping to salvage their weekend with a win to keep their slowly shrinking ECHL North Division playoff hopes alive. Things started off well for Worcester when at 7:05 of the opening period Ryan Hitchcock threw a centering feed to Tyler Barnes, and with basically all 24 square feet to shoot at Barnes made it 1-0 Railers. Barry Almeida had the secondary assist on the goal. But like it was all weekend Worcester didn’t attack the Reading net with any consistency, and despite having 29 shots on goal Royals netminder Jamie Phillips was hardly tested. Reading would tie the game on a Michael Huntebrinker goal with a minute left in the opening period when he beat Railers goaltender Blake Wojtala to the far post on the blocker side. At 1:54 of the second period Brayden Low made it 2-1 with a shot that appeared to hit someone in front of Wojtala and it deflected into the net. There’s almost no worse position to be in than playing from behind during the last period of a three in three after a long late night bus ride, but that’s exactly where Worcester found themselves. The Railers inept power play came back to haunt them yet again when they couldn’t convert on their third period opportunity, and all that was left was to watch the clock wind down after former WorSharks forward Adam Schmidt scored on a two on one at 11:46 to give Reading the 3-1 advantage. Kevin Goumas added a meaningless empty net goal at 17:00 for the 4-1 final. Worcester now had six games remaining and essentially has to win out and get some help to qualify for the playoffs. They begin that uphill climb next Saturday at the DCU Center against the Brampton Beast. Scratches for the Railers were are Evan Buitenhuis (Day to day/lower body), Tommy Kelley, Kyle McKenzie (14-day IR/season), Ross Olsson, Tommy Panico (14-day IR/season), and Alex Vanier (14-day IR/upper). Mitch Gillam was the back-up netminder. Yanick Turcotte had 12 penalty minutes in the game, giving him 343 career penalty minutes for the Railers. That jumps him over Sylvain Blouin for 18th all-time in Worcester pro hockey history. Blouin’s 337 career penalty minutes for the Worcester IceCats came entirely during the 1999-2000 campaign, and is the single season record for the city’s pro teams. In something this writer teased on the game posting for Friday’s overtime loss to Maine, I learned something odd about the DCU Center that I didn’t know before. It seems there is a row of seats in the lower bowl that not only do the Railers not sell tickets for, they aren’t sold for any events at the building. It’s the last row on the metallic portion in section 112, the section that sits above the Zamboni entrance. Railers Senior Account Executive Connor Haynes told me about it Friday afternoon, and as I’d never heard of it brought me over to show me. There is a row of seats there that look like normal seats, but when folded down there’s no leg room at all. To say I was amazed is an understatement. Thinking this would fall under the old “typical Worcester mistake” I asked DCU Center General Manager Sandy Dunn about it. Turns out there’s no real story to it. In a previous upgrade that section was modified, and instead of having all the rows be narrow and uncomfortable they chose to make the last row unusable to provide all the rows in front of it the standard amount of leg room. So it went from “this could be a great story” to “just one of those things”. But it’s a thing most didn’t know, so now you do. 1st Period-1, Worcester, Barnes 27 (Hitchcock, Almeida), 7:05. 2, Reading, Huntebrinker 16 (DiChiara), 19:00. Penalties-Holmstrom Wor (tripping), 2:25. 2nd Period-3, Reading, Low 14 (Pohlkamp, Luukko), 1:54. Penalties-Mueller Wor (tripping), 19:39. 3rd Period-4, Reading, Schmidt 23 (Huntebrinker, Low), 11:46. 5, Reading, Goumas 5 (Brown), 17:00 (EN). Penalties-Drake Rea (tripping), 7:48; Gaudreau Wor (slashing), 12:53; MacDonald Rea (slashing), 12:53; Doherty Wor (roughing), 14:09; Turcotte Wor (slashing, misconduct – continuing altercation), 19:30; Mueller Wor (roughing), 19:43; Roos Rea (slashing), 19:43. Shots on Goal-Worcester 7-11-11-29. Reading 12-15-15-42. Power Play Opportunities-Worcester 0 / 1; Reading 0 / 4. Goalies-Worcester, Wojtala 1-3-0-0 (41 shots-38 saves). Reading, Phillips 22-11-2-1 (29 shots-28 saves). Linesmen-Judson Ritter (70), JP Waleski (51).